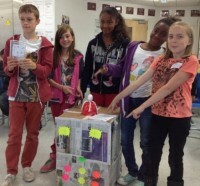 As lots of people return to school this week, our blog showcases some of our upcoming workshops! We’re always looking for new opportunities to develop our workshops and would love help from our fairandfunky friends – please share this blog far and wide – to teachers and youth workers, guiding and scouting leaders. At fairandfunky we empower people to take their own little steps to change the world in our specially designed workshops for schools and community groups, across Yorkshire and beyond! Each of our workshops focus on one of our key global themes: Fairtrade, recycling and the environment; and encourage participants to think about their sense of place in the world. 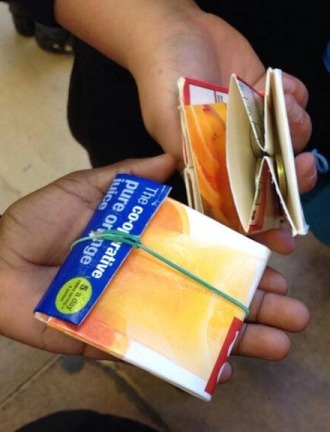 We’re celebrating World Fairtrade Day this year with a new workshop: “What’s in Your Wallet?” Using interactive games and discussions this workshop gets students thinking about where their money goes. We look at the people behind the supply chain, and develop knowledge on how buying Fairtrade adds value to communities. Each participant also makes a wallet from recycled juice cartons – to take with them as they go shopping and change the world! World Environment Day is another popular focus for schools and “Save The World With an Egg Box” is one of our favourite workshops. We encourage participants to collect together household junk and then design and make a machine which will save the world. Lively discussions surrounding climate change on local and global scales ensues; before a machine is made and pitched to peers in a Dragon’s Den style format. Excitement for The Grand Depart arriving in Yorkshire is building and at fairandfunky HQ in Holmfirth we’re always busy RE-cycling! We have been commissioned by Fountains Earth Primary School near Harrogate, to make a bike from recycled bottles. 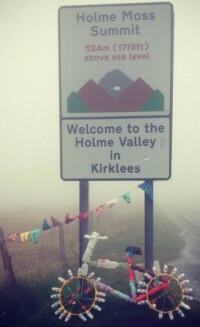 We have thoroughly enjoyed making a prototype and even managed to take it up Holme Moss to be the “King of the Mountain”! Does ‘Le Tour’ pass through your town? Would you like a special fairandfunky RE-cycle? Each participating school or community group receives a fairandfunky certificate congratulating them on taking their own little steps to change the world. And we now also have fairandfunky stickers for every workshop attendee!! Join us, and take your own little steps to change the world. Don’t forget to follow us on facebook , twitter and Pinterest for all up to date news on fairandfunky workshops and events. And do visit our online shop for some Spring bargains!